U.S. Patent No. 10,000,000 issued June 19, 2018 on Coherent LADAR Using Intra-Pixel Quadrature Detection. 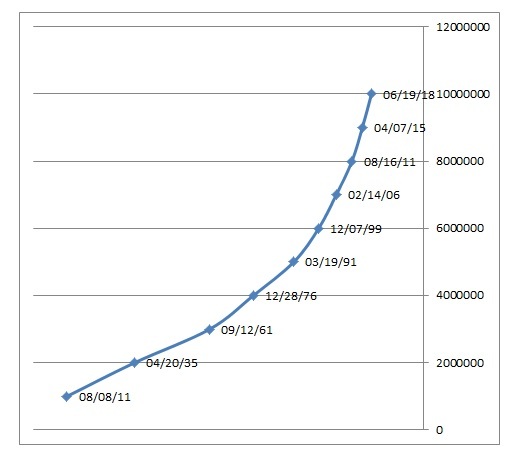 At the current rate, we can expect utility patent number 11,000,000 in 2021. Of course nerdy purists will point out that the 10,000,000 number does not take into account the X-patents — the 9957 (or so) patents that issued before it occurred to the Patent Office to begin numbering the patents in 1836. The nerdiest of these purists will further point out that the 10,000,000 includes numbers for which patents were withdrawn from issue, and does not include a handful of “fractional” patents issued over the years. This entry was posted in Asides, Patent of the Day by bwheelock. Bookmark the permalink.